Just a quick fly by to let you know I am alive and well and survived the blizzard of 2016! According to the National Weather Service, it is the largest snowfall on record for our town since they started recording amounts. Well gee, that's great but could we go back to the normal dustings or a couple inches of snow at a time that we're used to! Below is a picture of my picnic table taken around 10:30 yesterday morning, Saturday, January 23, 2016. We continued to have a steady snowfall well into the evening! With so much snow it was difficult for this senior with 3 beautiful senior goldens and one much smaller cockapoo to manage potty breaks. But I managed to clean a very small area for them and they were happy going outside one at a time to do what they had to and then making a mad dash back into the house. Henry, our silly cat, was totally fed up and ticked off so he spent his time doing what he does best, sleeping! And now the clean up begins! I saw you had a dreadful dumping of snow Tammy..glad you and your fur babies got through it..sending best wishes, hoping the clean up wont be too difficult..love you sweet whale card...very cute..take care. So glad you made it...through the storm that is, and thank you for keeping it all south of the border! Take it easy on the clean up. Lovely card, and I notice...there's no snow to be seen in it! Glad you made it through the Blizzard OK. Go easy on the clean up and let mother nature do most of the work. Cute card, by the way. My dogs would love that much snow to play in, but glad I don't have to deal with it. I was watching this on the news, but they mostly showed city streets that had been plowed. This is amazing, and more fell after this pic! That's a lot of snow to deal with! Glad all your critters didn't have to hold it in all weekend. That's such a cute Valentine! Star warm and indoors! Such an adorable card. I love the hearts coming out of their spouts. Too cute. Pfft...of course I'll be yours...as if you had to ask! Looove that you put a blushing whale on there too...LOL...that's adorable. :) I think that's a sign from God that you need to stay in and craft ALL day long for a few days.... YEAH!! Big hugs and best of luck on wherever you decide to put all that snow. That is more snow than I have seen in my lifetime, Tammy! What a sight to see! I hope you are staying warm with your fur babies! Your whale Valentine is super cute! I love the blushing cheeks! Whale, your card is absolutely adorable Tammy!! ...you know I adore LF!! :) You guys got hit with so much snow! I am in awe with all of the photos I've seen including this one from FB which I showed hubby. Glad it's over and you're doing well! Stay warm and safe...shoveling can be dangerous in itself too with that much snow! Best wishes! So cute Tammy - you just have the sweetest images and sentiments! Darling card. That snow looks pretty scary. A few flakes fell while I was driving home the other day and we all freaked out - this kind of snow would paralyze us! Seriously! Hope some has melted and your doggies can be more comfortable! Many hugz to you and them! Glad you're safe & well! That was a rather large dump of snow you had! 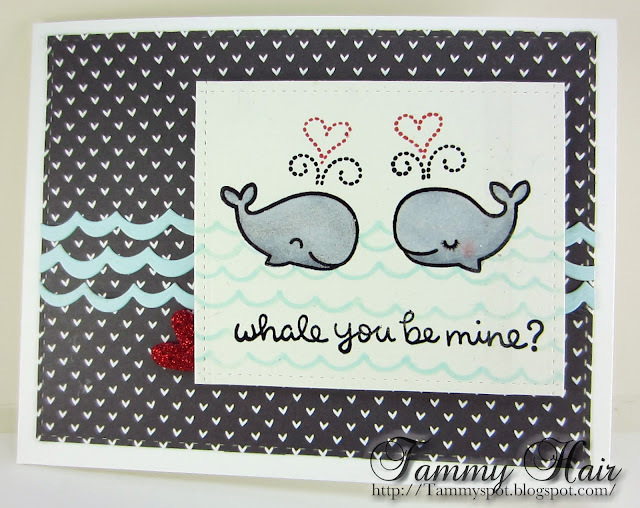 Love your little card, the whales & sentiment are just too cute!